Upon reflection, I would have to say that my most memorable backpacking trip was exploring the West Coast Trail (WCT) in the summer of 2016. 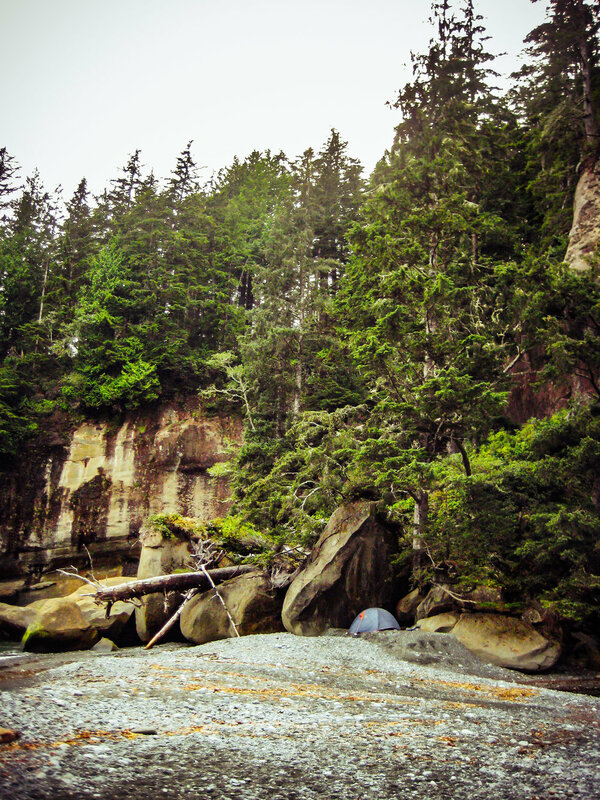 The WCT is located along the misty southwestern edge of Vancouver Island, BC, in the Pacific Rim National Park Reserve. Originally built to rescue shipwrecked survivors in the early 1900’s, it’s a 75km trail generally completed in 5-7 nights. 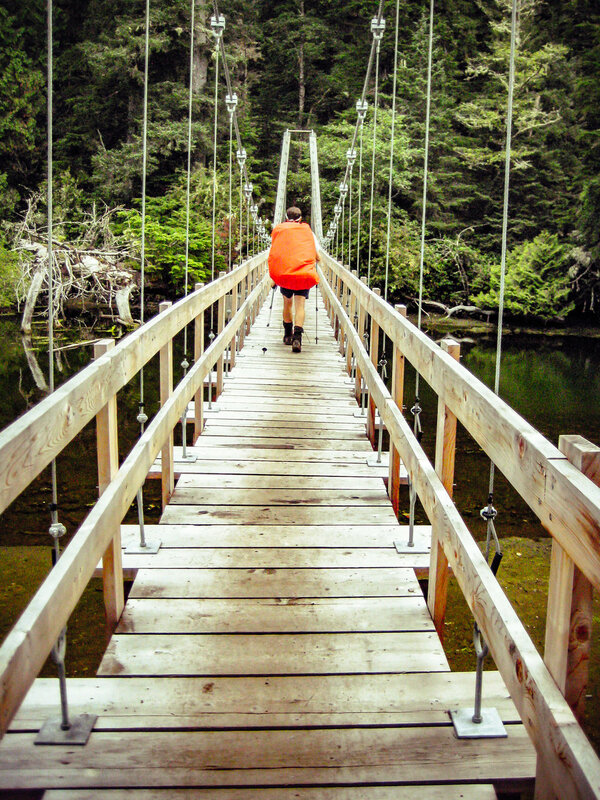 The trail winds, climbs, twists and descends its way along the rocky coast: through old-growth forests, beaches, and over many soggy bogs and mud puddles. I’ve done a few multi-day hikes in the Rockies as well as the Appalachians, but no other trip compares to the WCT’s unique and varied mix of ecosystems, history, culture, human interaction, and of course all the demanding physical structures that you have to climb, ride, or otherwise contend with. Alongside the breathtaking scenery, there are a few other factors that made my WCT trip such a positive experience. One of the most significant was the company of my hiking partner, Andrew, who is not only one of my favourite people to hike with, but also a great cook and expert rope knotter. He was the one who originally invited me on the adventure, kept us well fed, and was a pleasure to endure the hours of rain and mud with. 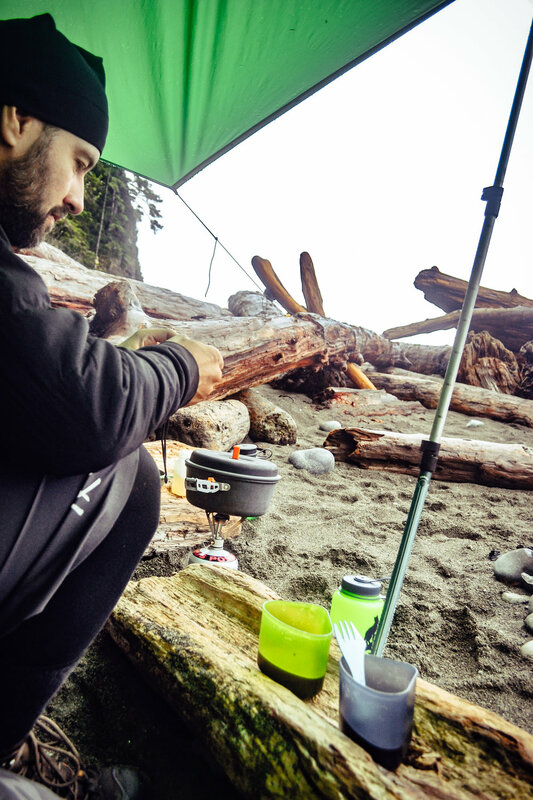 Below are some of the culinary strategies we followed to eat well while on the trail. We snacked a lot to make it through the strenuous days of hiking and climbing ladders. There is something about the fresh ocean air and climbing up and down multiple ladders with a pack that gets the stomach rumbling. For our meal planning, we had both allocated a Ziploc baggie (aka snack packs) each day that consisted of nuts, seeds, freshly-dehydrated fruit, homemade beef jerky, and, of course, some chocolate. We also brought a few energy bars for emergency situations. When you’re out in cold, wet weather putting in full days of hiking, you want great-tasting food that will revitalize by providing warmth, nourishment, and strength. A reasonable goal is 1.5 to 2.5 lbs. of food (or 2,500 to 4,500 calories) per person each day depending on size, weight and exertion levels. At the same time, a common mistake is to pack too much food, forcing you to carry unwanted bulk and weight. Experience will teach you what amount of food works for you. Make a menu plan and try to stick to it, allowing for an extra meal just in case. We stuck to good ol’ oatmeal, but we both actually love oatmeal, so it wasn’t a chore to wake up to. We added lots of extra nuts, dried fruit, and powdered coconut milk for more flavour. For coffee, we could have used the Aeropress, but the Starbucks Via dark roast coffee packets we came across were so light that we couldn’t say no, and they actually didn’t taste all that bad to boot. We allowed enough for two cups each day: one at breakfast and one for lunch. Enough said. We always made sure to stop and put our feet up for a bit. We tended to have some Babybel cheese, more jerky, and when it was cold and wet, we grabbed our stove and boiled water for ramen and treated ourselves to another coffee. 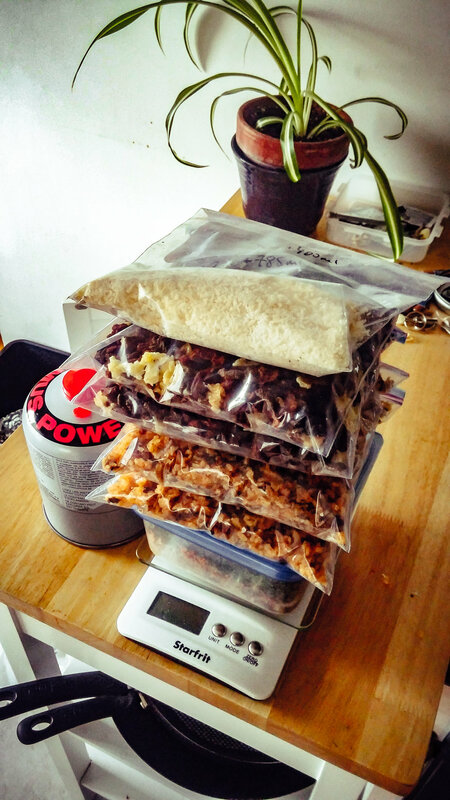 A lot of fellow hikers dug into their packs and pulled out store-bought bags of dehydrated food specifically intended for outdoor excursions, but there are many alternatives to consider. Packaged meals of this type can be expensive and sometimes bland, but making your own food can be cheap, satisfying, and tasty. We decided to try our hand at dehydrating own meals. Andrew took the lead on this, and with his chef hat on, created amazing main-course dinners like a creamy mushroom and chorizo risotto, chili mac, and a tofu and kale dragon rice bowl with a chili ginger sauce. He also took care of the snacks. He made the best beef jerky I’ve ever had, and dried a bumper crop of fresh fruit that his parents gave him from their orchard. Yes, it was certainly more time intensive than grabbing bags off the shelf, but it was also pretty easy and the outcome was well worth it. Basically, he found recipes that we would want to eat at home, making sure they were full of good fats and carbs, and cooked them as one normally would. Then, he portioned and weighed them while still fresh, and stuck them in the dehydrator for 8-10 hours overnight. Once dried, he weighed the portion again to find out how much liquid we would need to add to reconstitute, and he separated them into Ziploc bags for each meal. Once on the trail, we simply added the correct amount of boiling water, let them sit in the pot (wrapped in a toque!) 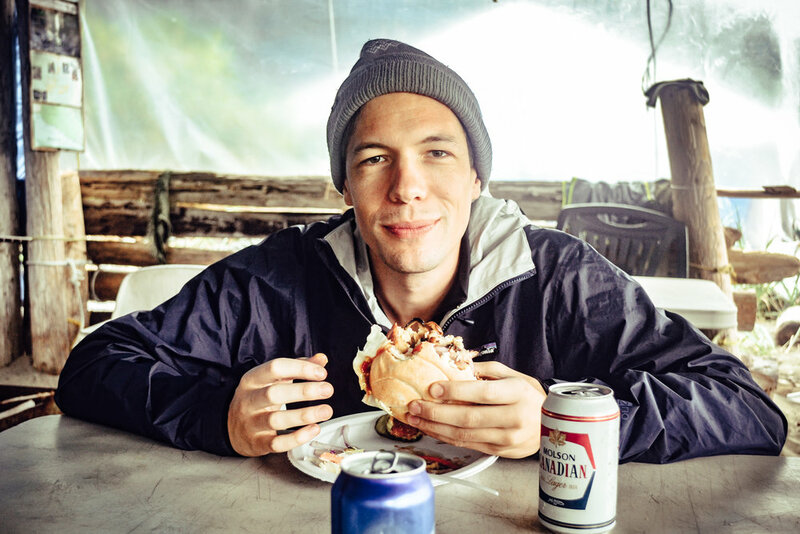 to rehydrate, and voila: satisfying gourmet meals on the trail. One thing to note is to cut up any meat products very small, or use ground varieties, as the meat took a little longer to get back to its normal state. If you don’t have a dehydrator, just remember that grocery and bulk food stores have a lot more dehydrated food than people realize. Think of your favourite meals and look for the dehydrated ingredients to make the recipe (e.g. sauces, pastas, grains, dehydrated mushrooms, sun-dried tomatoes, etc.). Amazon.com can also be your dried food saviour. You might also want to consider making a small backpack pantry with salt and pepper, garlic salt, basil, cayenne, cumin, crushed red pepper, cinnamon, or whatever else you might crave. 3. Bring Ca$h For Treats! At one point, you may smell a bbq and think that you are hallucinating, but rest assured, you are not going crazy! You have stumbled upon the exclusive oasis of a restaurant called Chez Monique’s: a burger shack located on the beach near the Carmanah lighthouse. It may be the most expensive cheeseburger you’ll ever eat ($20+), but worth every penny. (Note: they also have veggie burgers.) We washed them down with cold beers ($7+) while planning the next leg of our hike. Also worth considering, the water taxi crossing at the Nitinat Narrows sells freshly grilled salmon, Dungeness crab, and baked potatoes ($20+). It was particularly cold the morning we crossed over, so we stuck with a steaming baked potato drenched in melted butter, several cups of coffee with (real!) milk, and a few cookies for dunking. We opted to use a Steripen for purifying our drinking water over tablets. The Steripen is an ultraviolet, handheld water purifier that works by inserting a lamp into a Nalgene bottle, and in less than 2 minutes you have bacteria free water. The water runs pretty clear on the WCT, which is optimal for the Steripen. In murky or silty water another filtering system would be more advantageous. In our case the Steripen was compact, fast, and efficient and worked extremely well for our needs. There were streams of moving water spread along the trail and at each campsite, so keeping our two Nalgene bottles full of drinkable water was never a problem. We also brought Aquatabs too, just in case. We always made sure our bottles were full before we went to bed so we wouldn’t be fooling with them in the morning. Note: if using a Steripen, be sure to bring extra batteries. We somehow forgot, but were able to find some from other hikers. We had used each of these stoves extensively on other trips and love them both for different reasons. On this trip, because we were pretty much just using it for boiling water, we went with the Pocket Rocket. It’s simple to operate, boils water efficiently, and packs away small. We each carried a canister of fuel and had plenty left over at the end of the trip. You could also potentially have fires on the beaches, with driftwood being so plentiful along the way, but because of the dampness of the coastal area, I wouldn't count on it. Our mugs doubled as bowls, two sporks were brought, and we shared a pot so that packing (and clean-up) was simple. 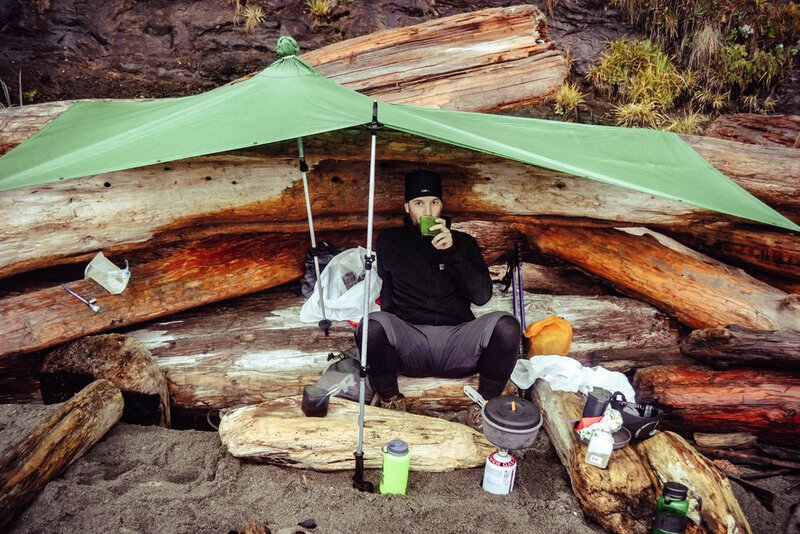 Expert cooking tip: bring a lightweight tarp and extra rope for a drier wild kitchen and dining room experience. • Use the provided bear bins, or hang food properly in a tree. Never leave anything with a scent at your campsite overnight. • Cook away from your tent as well as your neighbour's tent! • Follow the rule “pack out what you pack in.” Never leave any garbage (especially in the bear bins). 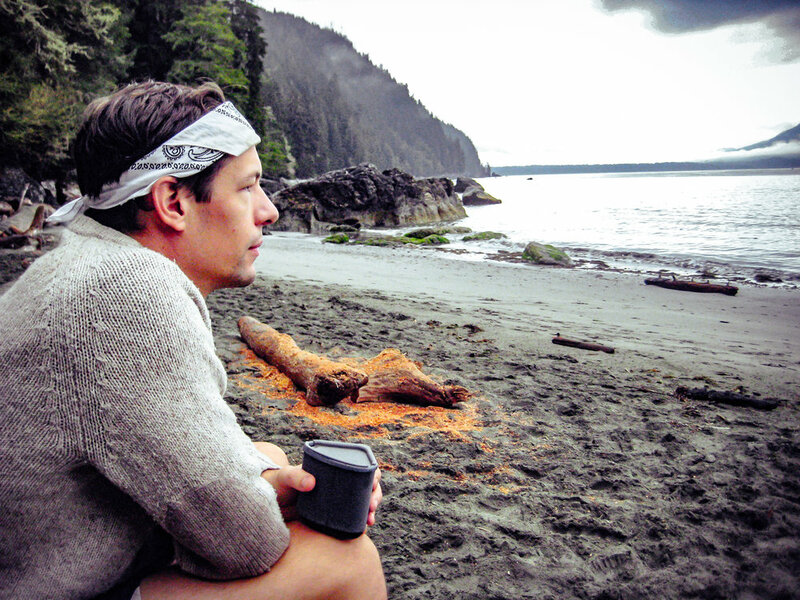 If you see garbage in a site or on the trail, pick it up and respect the land you are on that is cared for by Parks Canada and the three First Nations who call the remote area home.